For many years it has been customary for the clergy of the Australian-New Zealand Diocese to gather together during Great Lent to discuss matters of pastoral concern and liturgical practice. In recent years, it has become usual for such gatherings to be held in conjunction with the annual Diocesan youth activities during December. In December 2015, clergy from all four deaneries convened in two locations. The first gathering was at the Luther Heights Camp at Coolum Beach, Queensland, the site of the Diocesan Teen Retreat. The second was at Camp Manyung in Mount Eliza, Victoria, the site of the over-18s Diocesan Youth Conference. 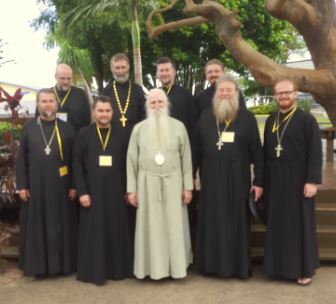 The clergy who participated in the Queensland conference were Bishop George, Archpriest Gabriel Makarov, Archpriest George Lapardin, Priest James Carles, Priest Gabriel Lapardin, Priest Evgeny Kulanov, Priest Andrew Smith, Priest Alexander Paramonov, Protodeacon Alexander Abramoff, Protodeacon German Polorotov, Deacon Bill Konstantinidis and Deacon Vladimir Bigdan. Also present was Archpriest Serafim Gan, a former and highly-regarded cleric of the Diocese visiting Australia from New York. The clergy who participated in the Victorian conference were Bishop George, Mitred Archpriest Michael Protopopov, Archpriest Nicholas Karipoff, Archpriest Gabriel Makarov, Archpriest Nicholas Dalinkiewicz, Archpriest Peter Sheko, Archpriest Boris Ignatievsky, Archpriest Simeon Kichakov, Hieromonk Dorofei (Urusau), Priest James Carles, Priest Alexander Paramonov, Protodeacon Alexander Abramoff, Deacon Alexei Jukoff and Deacon Mark Woloszyn. Apologies were received from Mitred Archpriest Nikita Chemodakov, Archpriest Alexander Morozow, Priest John Weir, Priest Alexander Borodin, Protodeacon Alexander Kotlaroff, Deacon Stephen McKay and Deacon Edward Waters. At both conferences the assembled clergy gave careful consideration to draft Guidelines for Handling Allegations of Sexual Misconduct prepared by the Diocesan Council Governance Committee. A number of improvements to the Guidelines were suggested and attention was given to the importance of observing boundaries in the relations of the pastor with his parishioners. The Guidelines will now be revised and referred for legal opinion before being submitted to Metropolitan Hilarion for endorsement. The clergy were advised of a number of anniversaries in 2016 of significance in the life of the Diocese and of the wider Russian Orthodox Church Outside Russia, and of Diocesan Council plans for commemorative events and services to mark them. These are the twentieth anniversary of Metropolitan Hilarion’s service as Ruling Bishop of the Diocese, the fortieth anniversary of the repose of Archbishop Sava (Raevsky), and the fiftieth anniversary of the repose of Saint John of Shanghai and San Francisco. To these the Victorian conference added the sixtieth anniversary of the gift to the Diocese by Protodeacon Peter Grishaev of the land on which the Our Lady of Kazan Convent and the facilities operated by the Fraternity of the Holy Cross now stand. With regard to liturgical practice, it was affirmed that within the Diocese it was the traditional practice when priests are concelebrating at Divine Liturgy for the main celebrant alone to say the words “Let us who mystically represent the Cherubim…” (“Иже херувимы тайно образующе…“) and “O Lord, Who didst send down Thy most-holy Spirit…” (“Господи, иже пресвятаго Духа…“) aloud with hands raised. It was also affirmed that it is not the traditional practice of the Russian Orthodox Church Outside Russia to place an oil lamp before the tabernacle on the Holy Table. A number of other minor liturgical matters were discussed, together with the possibility of a visit to the Diocese of the myrrh-streaming Hawaiian Icon of the Mother of God, a range of administrative and pastoral matters, and aspects of Diocesan life. God willing, the clergy will next gather on 24-25 March for the customary Great Lenten Pastoral Conference in which, to the extent possible, all the clergy of the Diocese will participate.